Fine artists have been putting garbage in the museum for 100 years, and it’s now so pervasive as to be cliche, look at Chelsea, look at any Bienniale to see halls upon halls of re-purposed detritus. Artists can’t look away from our epic belch of crap. So I’m not sure why I can’t think of any other writer besides George Saunders who is truly re-purposing garbage in literature. (There must be lots, right? Tell me in the comments, please.) Garbage meaning the language and logic of political cliche and corporate team-building. 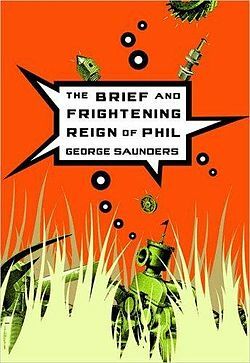 Watching someone else locate the dimwitted and cliche in our public discourse (“stand idly by” “said gravely” “closure is reached,” “just really torn”) is immensely satisfying, and it saves “The Brief and Terrifying Reign of Phil” from being too much of its moment and too much of a gimmie for Bush-haters. Saunders has been broader, of course, (see my reivew of Tenth of December) but this is an enjoyable entry in the minor arcana. The only part that’s really not working for me, funnily, is the art. Why are there small, blotchy, and vague black-and-white graphics in this book? Who made the choice to emphasize the cartoony-ness of Saunders with actual cartoons? Sigh.